I set up 1st class tutors, because I wanted to provide a tutorial service that offered excellent professional tuition, but also provided the tools to build confidence and help students be less fearful about Maths and English, which then leads to them succeeding in these areas. We are very successful in this. All our tutors are qualified teachers, who feel passionate about education. 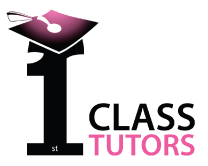 You can rely on 1st Class tutors to be reliable, informative and confidential. Tutorials are often conducted in student’s homes and our mission is to make that process as stress free as possible. 1) An assessment appointment is the first step, which is completely free, this means that you get to meet the tutor and the tutor can assess what programme of study is needed. 2) But there is no pressure at that appointment; in fact we encourage you not to make a decision on that meeting, so that parents and students have time to think before they decide on tuition. 3) We never prolong tuition and always start with a 6 week programme of study first, then discuss whether a longer period is needed. 4) Throughout tuition, there is an assessment process, so that both students and parents are always kept informed of progress.